The very smooth and shiny finish of polished concrete floors tend to give people the impression that they’re slippery too. Nothing, however, can be further from the truth. Polished concrete floors are completely safe to walk on. The reason? They are subject to rigorous slip resistance tests. It’s a procedure that we are very strict about, in order to guarantee that all our products are slip resistant and absolutely safe. How is slip testing on polished concrete floors done? Read and discover the details, one of which may surprise you. Safety is always the primary concern, and slip testing is one of the top ways of ensuring that floors, particularly the polished concrete ones, are always safe to walk and work on. Considering that in commercial and industrial environments, where even the most minor slip-up (pun intended) can lead to litigation, what is underfoot is of utmost importance. At Honestone we make sure that new flooring projects undergo slip testing by a qualified certifier, all in keeping with the highest of standards. For commercial, industrial and residential environments, an “R slip rating” is often specified as crucial. The “R” here stands for “ramp test”, and this test involves the active participation of a human being. A ramp test is performed with a person literally standing on the testing surface. That surface will then be lifted to an angle until the person—who typically wears a safety harness—slips off. The surface will then be rated based on the angle. This method may be surprising, but has some obvious merits in realism. The “R” slip rating method, however, can’t be used for slip testing flooring produced onsite, or in-situ. After all, one cannot just pick up your floor and put it on a ramp to be tested. As per the Australian Regulatory Standard, AS4586, new pedestrian surfaces can only be wet tested by the “pendulum method”. The wet pendulum slip resistance test is conducted using a portable friction tester device. It consists of a weighted foot with a test slider that swings down and slides across the surface wet with water. The weighted foot is comprised of a spring loaded rubber test slider that exerts a prescribed force over the specimen as it slides across the surface. The mobility of the pendulum method allows certified technicians to produce an accurate test. The results are then expressed as a British Pendulum Number (BPN). Tested over several locations of a floor, the mean BPN value is calculated and then converted into a classification ranging from P5 (external ramps greater in ratios of 1:14, swimming pool ramps, loading docks, commercial kitchens) to P0 for new pedestrian surfaces. Prior to mid-2013, the classification ratings ranged from V to Z . The most recent version of the standard, however, now uses the P ratings, with the added P0 classification, which represents a very high risk of slipping. 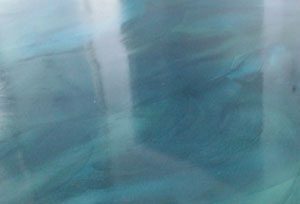 Polished concrete floors that have passed strict slip resistance tests are generally safe. 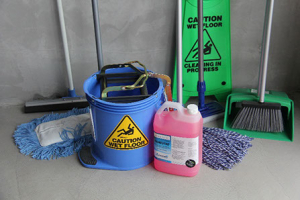 However, there are other external factors that can make such floors slippery and therefore unsafe. This is where the owners of homes, commercial establishments and industries that have polished concrete floors come in. They can also do their part in keeping their floors slip resistant, and here are some tips to do just that. 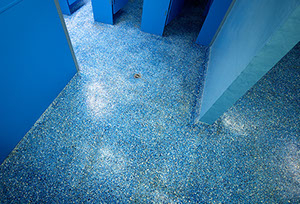 Keep your polished cement floors clean and free of standing water, grease and oil. Any spills or stains should be cleaned up immediately. Periodically apply an anti-slip conditioner, which helps make even wet surfaces safer. This type of conditioner has special additives that increase traction. Applying a sealer coat that contains an anti-slip grit additive is also a good idea. This sealer improves traction, but keeps the appearance of your concrete floor as polished as ever. Slip-resistant tapes are industrial-strength liners designed to increase the traction on a surface, including polished concrete floors. They come in a wide variety of colours, shapes, textures and widths. When installing slip-resistant tape on polished concrete floors, make sure that the surface is thoroughly clean to ensure superior adhesion. We at Honestone believe that slip resistance tests should extend to all high risk areas of floors and walkways. Making them part of an ongoing monitoring program to take into consideration changes in the immediate environment to monitor effects of contamination and surface wear would also be most certainly welcome.